Battle at Sea: American sailors from the destroyer Stephen Potter are looking at the light cruiser Houston (the Cleveland type), which was hit by a Japanese air torpedo. The light cruiser Houston on October 14, 1944 was heavily damaged by a Japanese air torpedo 80 miles from the Japanese-controlled Formosa Island (Taiwan). 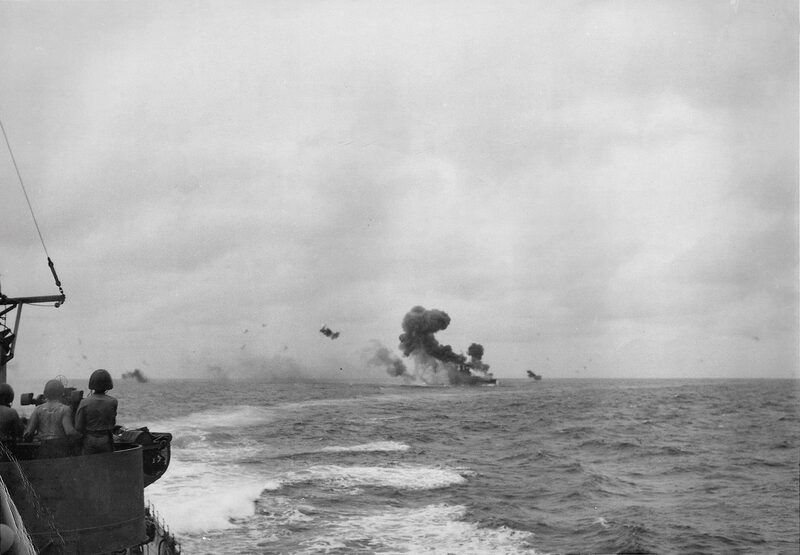 When towing on October 16, 1944, the ship was again damaged by another air torpedo. Thanks to the decisive and skillful actions of the crew, favorable weather conditions and good luck, “Houston” October 27, 1944 reached the American base on the Uliti Atoll.